This has been one of the busiest summers of my life. Even when my son was little, and I was working full time, my summers weren't this busy. Lots of time with grandchildren, recipe writing, and raising my parents, (teehee) and enjoying the beautiful weather! I hope that you all are experiencing the same kind of fun summer! Let's talk, menu planning. Do you plan your menus? Do you grocery shop and plan your menu so that you use everything up that you buy? I always get razzed about scraping things out with a rubber spatula, creating random recipes, etc to use things up. I paid for them, I am USING them. Am I right or am I right? When my son was little, he and my husband could always plan on something with baked potatoes the night after taco night, to use up the cheese and sour cream. After a roasted chicken night, they could plan on chicken salad sandwiches, or soup, or pot pie, to use up the chicken and veggies. If I don't do things like this, things get pushed to the back of the fridge, go bad, get old, and ultimately have to be thrown out. No, that doesn't happen very often with me anymore. Who can afford to through things away you pay for? Anyway, instead of the usual baked potatoes after "walking taco" night, I decided to try something new. I had one sheet of puff pastry that needed used, along with meat, cheese and taco sauce, and so I went for it. 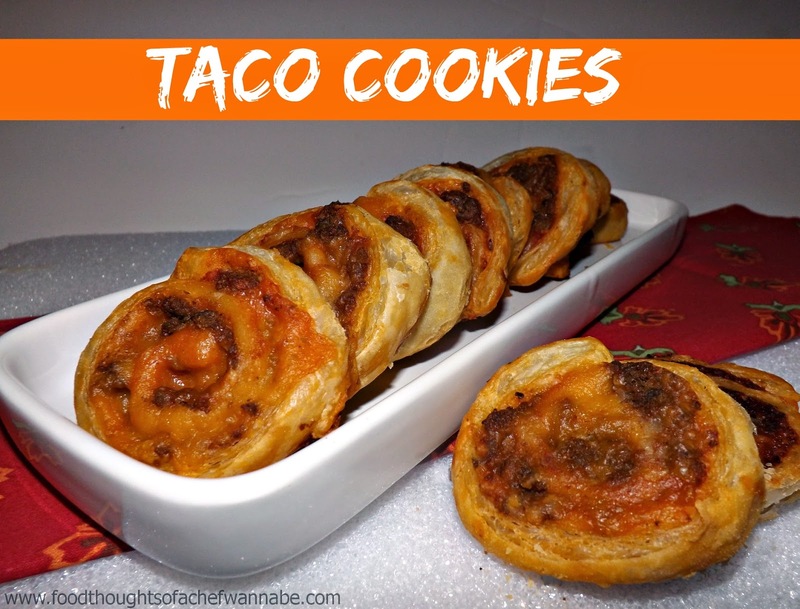 Taco cookies. I mean why not? Enjoy these for a snack, a light lunch, an appetizer..... Your family will love the change up from regular taco leftover fare! Preheat your oven to 375 degrees F. Lightly flour your work surface and lay out your pastry sheet. Using a rolling pin, just roll over it in each direction a time or two, just to make sure the seams are secure and you get a wee bit of size out of it. Now, spread 1/2 cup of taco sauce over the entire sheet of pastry, sprinkle on your taco seasoned ground beef, and then let the cheese rain down! Carefull roll it up into a log. You can chill this for 30 minutes before slicing into "cookies" or you can just go for it, like I did! Place on a parchment or nonstick spray coated cookie sheet and bake 15-17 minutes. Let cook for 5 minutes before removing from the pan. Now, sit and enjoy the glorious treat you have made! I bet nobody else brought "taco cookies" to the party, did they?